Old Plantation Flats Lighthouse was built in 1886 as a white rectangular screwpile with a tower on the roof. The lighthouse was located at the entrance to the channel leading to Cape Charles, Virginia and Old Plantation Creek. The lighthouse had an unusual foundation construction with a combination of screwpile and concrete pylons. The lighthouse was damaged in 1893 by ice flows and the fifth order Fresnel lens was destroyed. A month later a new fifth order lens was installed. The lighthouse was once again damaged by ice flows in 1918 and was later reinforced with concrete. 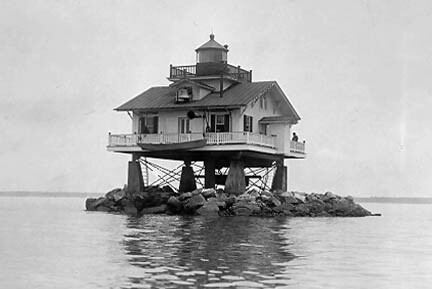 The lighthouse was deactivated in 1962 and dismantled. It was replaced with an automated steel skeleton tower built on the original foundation.